I had been sitting on this bottle of wine for a few months after seeing a review or two online that it was still a bit young. Filled with two grapes that are always a guarantee for a power packed, intense and fruit filled wine – I was excited to give this a try. I am a big fan of these two grapes on their own and think they add a lot to the blends they grace, but I think this is the first wine I have had that PV and PS were the only two in the blend. In their commitment to stewardship, they are stewards of the land they farm and start with the simplest of steps by sending out USB drives vs paper info sheets. Their commitment to sustainability encompasses everything from renewable energy to water management. 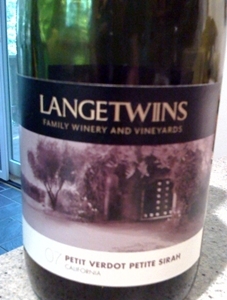 The 2007 Lange Twins Generations Petite Verdot/Petite Sirah is a 66% and 34% blend respectively. Only about 200 cases of this wine are produced so I feel lucky to be one of the people getting to try it. This was definitely a big wine but also definitely ready to drink now. The tannins were big and ripe but not too over the top “velcro” tannins as I like to say. Tons of rich, dark fruit with nice smokey and dried herb notes that round out the flavor/aroma profile nicely. At $20 it is a good value for a big fleshy, fruit filled wine when you are in that “New World” mood. I look forward to trying more of the Lange Twin offerings. Sugarleaf Vineyards is located in the Monticello region of Virginia, twelve miles South of Charlottesville. The vineyard was originally planted to be a hobby for friends and wine enthusiasts Jerry Bias and Mike Taylor. The original vines were ordered before Mike was tragically killed in the events of 9/11 in New York City. After all of the time, effort and research that went into planning the vineyard, Jerry thought it only fitting that he continue the dream of his friend and started planting the 2,075 vines himself. Realizing the work that was required to handle a 4 acre vineyard on his own, he decided to bring in professionals for some additional help and went on to produce some great harvests in 2003, 2004, and 2005. These vintages were sold to local wineries that produced award winning wines from the Sugarleaf Vineyard grapes. In 2004 construction began on Sugarleaf’s very own winery which produced it first vintage in 2006. In October last year (2007) we got a chance to visit Sugarleaf while they are in the midst of their 2007 crush. Winemaker and vineyard manager Daniel Neumeister can be seen in the picture below pressing their Vidal Blanc. I got a chance to speak with Daniel that day, and got a true appreciation for his respect for the grapes. He believes that the vineyard and the winery should be a continuous experience for the wine, not a separate one. I couldn’t agree more! So recently Megan and I sat down with a bottle of the Sugarleaf Vineyard’s 2006 Petite Verdot (PV) of which only which 78 cases were produced. This estate red was made from 100% PV grapes that spent 8 months in a combination of American (90%) and European (10%) oak before being bottled. This was good wine, a great effort for the first vintage of Sugarleaf Vineyards. On the PV scale, it was not as rich and powerful as I like PV’s to be. It was still slightly green, and the tannins were still a little tight which would should smooth out after a couple more years of aging as they did calm down after being in the decanter for a couple hours. At $28 it has the problem that a lot of the better wines in Virginia have, and that is their quality, price ratio. For 30 bucks you can get a pretty rockin’ wine, or 2 pretty rockin’ wines. I understand where the price comes from though don’t get me wrong, only 78 cases produced, single vineyard, hand harvested and a brand new winery. Hopefully as Sugarleaf gains some economies of scale over the next few vintages their prices will reflect that and/or the wines will continue to get better (don’t forget I did like this wine) and warrant the higher price tag. Sugarleaf as a beautiful estate, a lovely little tasting room and a state of the art facility you can take a tour of. So if you are in the Charlottesville area doing some wine tasting, definitely put Sugarleaf on your list. Click the icons below to add this post to your favorite Social Bookmarking site.